Announcement Welcome to Dazzle Me Gems Beaded Jewelry Shop! Here at Dazzle Me Gems I strive to bring you beautifully, well made, unique bead woven jewelry. Please don't hesitate to ask questions, we're always available. Enjoy browsing and check back often for new updates. Please read our policies page before purchasing. Welcome to Dazzle Me Gems Beaded Jewelry Shop! Beautifully. Bold. 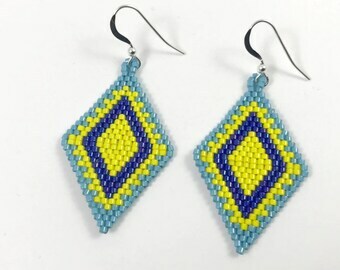 Bead Woven Jewelry. If for what ever reason you want to return your purchase, you have 3 business days to contact me including the day you received said item(s) and 4 business days including the day you received said item(s) to send it back. You will be refunded the full amount not including shipping, if package was sent out. For packages not opened upon arrival you have up to 5 days to request a refund. Items returned must be in an unworn condition, free of stains, perfume, ect. There will be no refunds on custom items. If your item(s) was damaged upon arrival a full refund including shipping will be returned or a new item will be sent to you at no cost, after damage item is returned and inspected. Payments are accepted through PayPal, Etsy and Etsy gift cards only for now. Canceling orders should be done before item is shipped or you will have to pay to have the item shipped back to us, unopened of course. You will be refunded the full amount if item did not ship. All items are shipped via first class. Priority mail is always an option. I do recommend up grading to priority for international customers, if you would like tracking. Depending on size jewelry will be packaged in a gift envelope or gift box. Tracking is always included for US customers. International customers must request tracking. An extra fee will be applied. Lost packages will be resent at no additional cost, after a claim has been made with the postal service used. To insure said package is lost. International lost packages will be resent as well but shipping must be paid again, if tracking was not purchased. Please contact me first before buying if you would like your items shipped in any other way than what we supply. Packages are sent out Monday-Friday. Items received on Thursdays may or may not ship by Friday. All ready made items ship in 1-5 business days. Custom items can take 1-3 weeks. Custom orders are accepted on all items unless otherwise stated. Please do not purchase the listing you want customized before you contact me, unless you are requesting a size change only. Custom orders can take 1-3 weeks to complete so please order in advance if you need said item by a certain date. Please have sizes and color choices ready when you contact me for an custom order. Pictures of color choices help, but are not necessary. If I do not have a color you are looking for it can be ordered at no additional cost. Custom orders must be paid before your item(s) is started. A custom listing may be produced for you.